متقی, علی اصغر. (1396). بهینه‌سازی مکان‌یابی زمین‌لرزه‌ها در منطقه البرز مرکزی با استفاده از تأخیرهای زمانی همبستگی شکل‌موج‌ها. 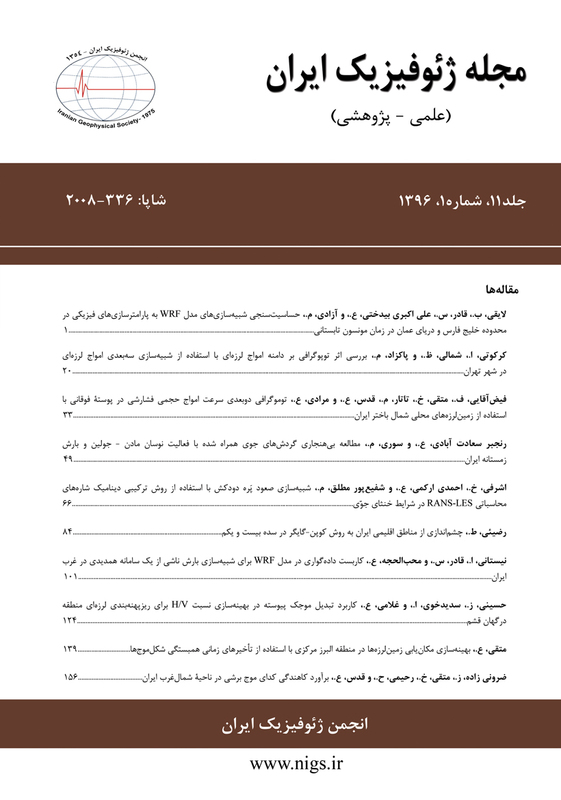 مجله ژئوفیزیک ایران, 11(1), 139-155. علی اصغر متقی. "بهینه‌سازی مکان‌یابی زمین‌لرزه‌ها در منطقه البرز مرکزی با استفاده از تأخیرهای زمانی همبستگی شکل‌موج‌ها". مجله ژئوفیزیک ایران, 11, 1, 1396, 139-155. متقی, علی اصغر. (1396). 'بهینه‌سازی مکان‌یابی زمین‌لرزه‌ها در منطقه البرز مرکزی با استفاده از تأخیرهای زمانی همبستگی شکل‌موج‌ها', مجله ژئوفیزیک ایران, 11(1), pp. 139-155. متقی, علی اصغر. بهینه‌سازی مکان‌یابی زمین‌لرزه‌ها در منطقه البرز مرکزی با استفاده از تأخیرهای زمانی همبستگی شکل‌موج‌ها. مجله ژئوفیزیک ایران, 1396; 11(1): 139-155. در مطالعه حاضر، تمام شکل­موج­های موجود برای منطقه البرز و مناطق همجوار آن به منظور مکان­یابی بهینه زمین­لرزه­ها مورد بررسی قرار گرفته تا تصویری واضح­تر از لرزه­خیزی این منطقه ارائه شود. در مرحله نخست مطالعه، همه فازهای P و S زمین­لرزه­ها، که در 41 ایستگاه لرزه­نگاری و بین طول و عرض­جغرافیایی 48 تا 54 و 33 تا 37 درجه در دسترس بودند، دوباره قرائت شدند. سپس 4152 زمین­لرزه با روش جک­نایف، که قادر است ارزیابی قابل اعتمادی از خطای اولیه را ارائه دهد، مکان­یابی اولیه انجام گرفت. در مرحله دوم، زمان رسید فاز P از روی همبستگی متقاطع شکل­موج­ها، بهینه کردن قرائت­ها و زمین­لرزه­های همبسته تصحیح شد. این نوع زمین­لرزه­ها، جفت زمین­لرزه­هایی هستند که در فاصله معینی از یکدیگر قرار دارند و شکل­موج­های مشابهی را در ایستگاه­ها ایجاد می­کنند. در پایگاه داده مورد مطالعه، همه این جفت زمین­لرزه­ها فاصله­ای کمتر از 10 کیلومتر دارند و اختلاف زمانی آنها معادلات خطی وزن­داری را تشکیل می­دهند که از روی کیفیت قرائت فازی طبقه­بندی شده­اند. به طور تقریبی، بیش از 280000 اختلاف زمانی از روی شکل­موج­ها محاسبه شده است که از بین آنها تنها مواردی با ضرایب همبستگی بیش از 7/0 برای مکان­یابی زمین­لرزه­ها انتخاب شدند. در مرحله سوم، به منظور کاهش اثر خطای احتمالی مدل پوسته، از روش اختلاف زمانی دوگانه در مکان­یابی زمین­لرزه­ها بهره­گیری شد. نتایج حاصل از 2409 زمین­لرزه با مکان­یابی مجدد که تنها از روی همبستگی امواج به دست آمده­اند، جمع­شدگی و انسجام زمین‌لرزه­ها در اطراف گسل­های مهم منطقه حکایت دارد. In this study, a complete waveform database of Alborz and its surroundings was processed so as to ameliorate the locations of the earthquakes and obtain an enhanced picture of the past decade’s seismicity distribution. In the first step of this study, P- and S-wave arrival times were manually re-picked at 41 stations extending from 33° N to 37° N and from 48° E to 54° E. Our initial locations, including 4152 events, were implemented using Jackknife resampling method, normally employed for statistical inference. This up-to-date technique reliably estimates hypocentral errors by deleting one observation at a time. In order to ensure that the relocation would provide valid results, only events that met certain criteria were selected. The selection criteria were (1) largest primary azimuthal gap between stations less than 210°, (2) arrival time residuals less than 1 s, (3) number of recording stations no less than 6, and (4) initial event uncertainty in epicenter and depth of less than 10 km. The second step of this study focused on improving the arrival time pickings of event pairs utilizing P-wave cross-correlation-based time delays. Correlated events are those occurring within a few kilometers of one another to generate similar waveforms. All event pairs with separation distances less than 10 kilometers were processed. The differential times of event pairs with corresponding travel time residuals for all observations were combined into a system of linear equations and weighed based on the quality of arrival time picks. We computed a total of more than 280000 P-wave differential times and selected waveform pairs with coefficients of 0.7 or larger. In the third step, to minimize the effect of inaccurate velocity structure, we applied the double-difference location approach. The algorithm, hypoDD, determines relative locations within clusters of closely spaced events using double-difference method developed by Waldhauser and Ellsworth (2000). By relocating merely closely spaced events, this algorithm ameliorates relative location accuracy along with reducing the effects of unmodeled velocity structure. The nearest neighbor approach was applied so as to link events using a maximum search radius of 10 km and a minimum number of 8 links. Event linkage strongly controls how the dataset is broken into clusters for relative relocation in hypoDD. For example, a single link between two closely spaced events, but perhaps occurring along different faults, causes all linked events to collapse into a single cluster rather than forming two clusters. Because of the relatively small number of stations recording each event and due to the closely spaced known faults in Alborz region, we, instead, visually prescribed cluster identification. In this way, we used such essential documentary sources as seismotectonic maps, the hypocenter locations of seismic events in the initial locating procedure, and the expansion of the major faults. The distribution of 2409 relocated events delineated more coherent features, and in general, the relative relocations increased the agreement with major active faults. The absolute and relative relocations discussed in the present research are an improvement because of either the carefully re-picked P- and S-wave arrival times or the applied appropriate waveform phase-picking algorithm. حسامی، خ.، جمالی، ف. و طبسی، ح.، 1382، نقشه گسل‌های فعال ایران: پژوهشگاه بین‌المللی زلزله‌شناسی و مهندسی زلزله. Abbassi, A., Nasrabadi, A., Tatar, M., Yaminifard, F., Abbassi, M. R., Hatzfeld, D., and Priestley, K., 2010, Crustal velocity structure in the southern edge of the central Alborz (Iran): Journal of Geodynamics. 49, 68–78. Aki, K., and Richards, P. G., 1980, Quantitative Seismology: Vol. 2, W. H. Freeman, New York. Ashtari, M., Hatsfeld, D., and Kamalian, N., 2005, Microseismicity in the region of Tehran: Tectonophysics, 395, 193-208. Baer, M. and Kradolfer, U., 1987, An automatic phase picker for local and teleseismic events: Bulletin of the Seismological Society of America, 77, 1437–1445. B. L. N., 1994, Errors in hypocenter location: Picking, Model, and Magnitude dependence: Bulletin of the Seismological Society of America, 84, 1978-1990. Deichmann, N., and Garcia-Fernandez, M., 1992, Rupture geometry from high-precision relative hypocenter locations of microearthquake clusters: Geophysical Journal International, 110, 501–517. Doloei, J. and Roberts, R., 2003, Crust and uppermost mantle structure of Tehran region from analysis of teleseismic P-waveform receiver functions: Tectonophysics, 334, 115-133. Frechet, J., 1985, Sismogene`se et doublets sismiques: The`se d’Etat, Universite ´ Scientifique et Me´dicale de Grenoble, 206pp. Gomberg, J. S., Shedlock, K. M., and Roecker, S.W., 1990, The effect of S-wave arrival times on the accuracy of hypocenter estimation: Bulletin of the Seismological Society of America, 80, 1605–1628. Got, J. L., Frechet, J., and Klein, F. W., 1994, Deep fault plane geometryinferred from multiplet relative relocation beneath the south flank of Kilauea: Journal of Geophysical Research, 99(15), 375–15, 386. Kuperkoch, L., Meier, T., Lee, J., Friederich, W., and EGELADOS Working Group , 2010, Automated determination of P-phase arrival times at regional and local distances using higher order statistics: Geophysical Journal International, 181, 1159–1170, doi: 10.1111/j.1365-246X.2010.04570.x. Menke, W., and Schaff, D., 2004, Absolute Earthquake Locations with Differential Data: Bulletin of the Seismological Society of America, 94(6), 2254-2264. Pavlis, G. L., 1992, Appraising relative earthquake location errors: Bulletin of the Seismological Society of America, 82, 836–859. Poupinet, G., Ellsworth, W. L., and Frechet, J., 1984, Monitoring velocity variations in the crust using earthquake doublets: an application to the Calaveras fault, California, Journal of Geophysical Research, 89, 5719–5731. Prieto, G., Thomson, D., Vernon, F., Shearer, P., and Prker, R., 2007, Confidence intervals for earthquake source parameters: Geophysical Journal International, 168, 1227–1234, doi: 10.1111/j.1365-246X.2006.03257.x. Schaff, D., Bokelmann, G., Ellsworth, W., Zanzerkia, E., Waldhauser, F., and Beroza, G., 2004, Optimizing Correlation Techniques for Improved Earthquake Location: Bulletin of the Seismological Society of America, 94(2), 705–721. Schaff, D., and Waldhauser, F., 2005, Waveform Cross-Correlation-Based Differential Travel-Time Measurements at the Northern California Seismic Network: Bulletin of the Seismological Society of America, 95(6), 2446–2461. Waldhauser, F., 2001, HypoDD- A program to compute double-difference earthquake location algorithm: metod and application to Northern Hayward fault, California: Bulletin of the Seismological Society of America, 90, 1353-1368. Waldhauser, F., and Schaff, D., 2008, Large-scale relocation of two decades of northern California seismicity using cross-correlation and doubledifference methods: Journal of Geophysical Research, 113, no. B08311, doi 10.1029, 2007JB005479.